Dave Landis, Keystone Safety/Compliance Coordinator, shows our certificate of approval for two more years. Considering our line of work, a considerable achievement! 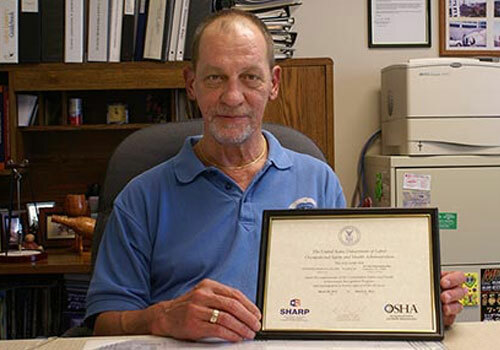 For the past ten years, one way Keystone has maintained its standing and status as a safe place to work is through participating in OSHA’s “Safety and Health Achievement Recognition Program” (SHARP). On March 22, 2013, Keystone was once again awarded a certificate of recognition and was approved through March 21 of 2015. The SHARP program is open to companies across the United States with less than 250 employees. It allows certified companies to forgo OSHA inspections for a period of two years at a time for exceeding government safety standards. They do this by focusing on three main disciplines: (1) the condition and safety status of the physical plant, (2) having a comprehensive, written safety plan, and (3) a thorough program of employee safety training.